The IX Center was OK as a feis venue. The PC/OC area was in the ballroom on the main level and was a good size room, but not adequate for the amount of people needing to be in there. Camping was not sufficient and there was lots of camping in the viewer seating. Many areas were marked ‘no camping’ but they were full of campers, and that caused some flow issues for people trying to get from the front to the back of the room. There were 3 stages labeled G – I, for PC and OC dancers. Stage sizes appeared to be about 20 x 24 and were small for the level of dancers performing on them. The stages were extremely slippery and there were lots of falls. The feis team mopped often but it did not help. There was pretty good separation between the stages, but music could be heard from neighboring stages. It did not seem to impact the dancers much though. Seating was not adequate for the viewers, but was probably all they could put in considering room size. The feis committee attempted to leave adequate room for people to move around (I refer back to the camping in the no camping area comment), but it really did not work out. Parking was good, not all ‘close’, but plentiful. It was a bit pricey at $8. The weather was not great on that day but there was a large covered drop off area in front of the venue. The room was set up the same, but it did not feel as cramped as last year, and flow through seemed easier. They had moved the stages farther into the room, so there was less congestion toward the front of the hall. Less falls this year but the stages were still slippery. The crew was ready with the broom and swept frequently. Parking was $10 this year. Side Bar: I really wish they could do something about the fumes in the lobby. I think they are from generators from the home show. It makes spending any time in the lobby nauseating. With the Girl Child having 3 dances, and dancing on 3 separate stages, and because PC dancers have 3 judges per stage, none of whom rotated to another stage, I have no complaints on the judging. I actually thought it was an excellent opportunity for the dancers, performing in front of 9 different judges for the feis. With 9 judges, comments were more well rounded than the typical 2 or 3 judges that you ‘might’ get at a grade level. Each stage had its own musician and I did not hear any complaints about music. Standard convention center food, hamburgers, cheesebugers, pretzels, pizza, wraps and salads, a coffee stand, various drink booths and beer. Food quality was OK but not worth the price. It was about what you expect for a convention center. We were actually done early and did not take advantage of concessions. George, the shoe guy, and Betsy, his daughter(who also responds to ‘George’s Daughter’ btw), the feis t-shirt table, wig ladies, a jewelry booth, an Irish wool and linens vendor, and the photographer. 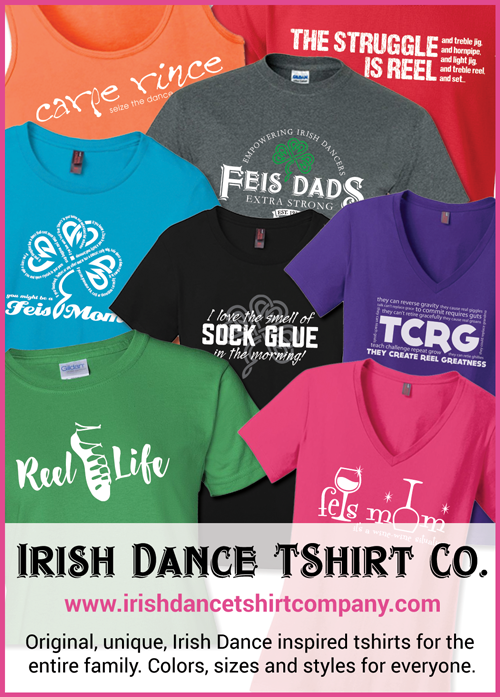 You can see all the vendors at the the feis site under Vendors. Another ditto. But, GEORGE was back after having been away from us for a while. Very happy to see you George! Results are different at Champ level, as some of you know. Results for all dances are completed, top 3 in each dance determined, and then the overall top half from the entire comp are determined. When they are ready, the dancers are gathered and awards presented. I can understand where it would take time to do this, but timeliness was only one of the issues I felt the results had. It took approximately 1.5 to 2 hours from completion of TGCs last dance to presentation of her awards. I felt that was a little long, granted, I have never tallied a PC comp so that might be normal. Results were presented in an area on the lower level that would have been fine if comps had been done one at a time. Thing is, they waited until somewhere around 5 comps were ready before presenting the awards. Picture if you will, 5 comps of dancers with 10 – 20 dancers each, the parents and friends for all those dancers, and dance bags and zucas for some of them, crammed into an area not fit for that many people. It was difficult for dancers to get to the presentation area when called, and for spectators to see, and picture taking was next to impossible. Not planned well at all. I feel simply doing them one comp at a time would have helped tremendously. Huge improvement over last year! Time from dance to awards dropped to somewhere between 60 and 90 minutes. They moved the results up to the side of the venue lobby which is a huge area and added a podium. There was plenty of room for dancers and families. Flow was not bad considering the number of dancers, TGC had three dances on three separate stages, with about 20 dancers in the comp and she was finished in roughly 2.5 hours. Since this is only the second PC feis we have attended, I really do not have a standard to judge it by, but I thought that was pretty good. Ditto, right down to the number of dancers. Oh, I have a lot more than 2 PC feiseanna under my belt now. Overall, I thought this was a better feis than last year and would put it in the 7.5 to 8 category. 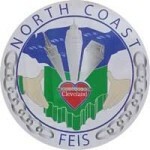 What did you think of the North Coast Feis 2015, Champs Levels (on a scale of 1 - 10 with 1 being lowest)? We missed each other again. :-) Yeah, the camping sitch is a problem. It would have been nice to be able to take advantage of the unused! “bar” with its abundant tables and seating just inside the Home & Garden Show, right next to the lobby, but it would have upped the venue cost considerably. Parking costs, unfortunately, are decided by the IX Center, not the Feis organizers, and I would imagine that there were more than a few people annoyed at the increase. I know I was. I didn’t see any slips on the marley flooring during Miss M’s competition, but she danced early. Other than the annoying place where they were given, what did you think of the awards? The barriers around the grades stages were gone, which made for a much nicer traffic flow and a much safer situation in case of a fire. They overbooked judges this year to avoid what happened last year when a judge got trapped in Chicago. The overbooking was a good thing because a judge happened to get sick. The flow of the feis was fantastic this year! The only grades issue that wasn’t addressed was the end of day results posting and awards. Like last year, the results were on line with lightening speed until about 3/4 of the way through the feis. Then it all came to a grinding halt. We waited 40 minutes for our final results, then had to stand in line for 30 minutes to collect the medal. Hopefully that will be corrected for next year. This feis seems to be run by a very hardworking group that seeks to get better and better each year. Can’t wait to go back next year! I wanted to respond that moving the winner’s podium and champ awards to the main lobby was an outstanding improvement. Last year, my dancer was still in prizewinner and unfortunately, was on one of the stages directly in front of the podium. Champ award presentations are always full of excitement and happy squealing and this one was no different. The result was that our dancers and their musician had a terrible time hearing. This year, my dancer competed in her first NCF prelim competition and awards were held in a location in the main lobby that was out of the way, but easy to locate and access. This was perfect, especially since there were multiple groups waiting on results through out the late morning and afternoon. All the groups were able to stay nearby to wait for the results schedule to be updated without having to worry about blocking anyone’s access. I also liked the way the awards ceremony itself was handled. Instead of simply calling the placed dancers from the crowd in reverse placement order, they called all the placed dancers to the front of the podium and THEN called their name/numbers in reverse order. This sped the process up and awards ran very smoothly! I don’t know what the other placed dancers received, but my dancer received a beautiful Celtic themed cup from a company called “Clara.” Of all the prelim competitions she has placed in, this is her favorite award. The grades/round medals have always been pretty and this year was no exception. One of the dancers in our group competed in “First Feis” this year. When she checked in, she was given a teddy bear with the NCF logo on its chest. She was absolutely thrilled and surprised as this was completely unexpected! What a thoughtful gesture! As far as food, the venue offered a reasonable assortment of options. As with most feisanna, the lines were quite long at lunch time. When my dancer expressed that she felt her blood sugar was tanking, I had to abandon the line for hot food after ten minutes and settle for a muffin from the coffee stand. It was enough to get her through her last competition, but I would have liked to have been able to get her something hot since she hadn’t had anything hot to eat so far that day. The parking does seem a little high, but as stated before, this isn’t something the feis committee has control over. We carpooled, as the committee recommended, so it wasn’t so horrible for us. However, for the families that didn’t have that option, $10.00 is a little steep for open air parking. Overall, this is a great feis. We have done NCF three times now and can’t imagine skipping this one, save for illness or extreme weather!